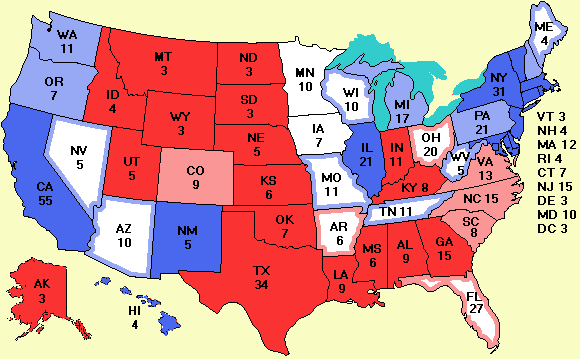 Only a couple of polls today, but Zogby will be releasing polls on all the battleground states tomorrow. That will surely shake up the electoral college. Check back tomorrow. For today, the only real news is that New Jersey is once again solidly for Kerry. This result is more consistent with previous polls. The Fairleigh Dickinson poll was probably a fluke. While I do strive to keep the main page nonpartisan, I did come across something amazing. Ron Reagan, son of President Reagan, wrote an article for the Sept. Esquire entitled The Case Against George W. Bush. If Chelsea Clinton or Amy Carter writes an article "The Case Against John F. Kerry" I will certainly link to it. In the spirit of balance though, I came across a new site with a funny title: Spanking the Donkey. If you are a conservative, you will probably like it. No matter if you are a liberal or a conservative, hopefully you want an accurate count of the vote. The 2004 election is going to feature electronic (touch screen) voting machines. They have failed numerous times in the past and are a disaster waiting to happen. Imagine six Floridas (except without the nice beaches). Check here for more information.